Trader Matt Maley sees "a glimmer of hope" in American Airlines, despite its nosedive following its cut in profit expectations for 2018. The airline's announcement sent shares down as much as 10.9 percent Thursday. It's down more than 2 percent Friday morning. 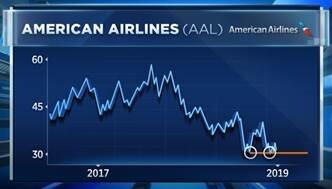 Appearing on CNBC's "Trading Nation," Maley noted on Thursday that as the market fell to fresh lows in December, American Airlines managed to hold steady at its prior lows from October, finding resistance around $30. "Even at the stock's lowest level in the morning, it did not break below that level," the Miller Tabak strategist said. "So there's a little glimmer of hope. If the stock could rally strongly anytime in the near future, we might be able to see a little light on this." Many investors have pegged a broader sell-off in airline stocks to waning oil prices, but Maley disputes the notion. "One old rule on Wall Street that has never really worked is that airlines stocks go in the exact opposite direction of fuel prices, or oil prices," Maley said. "If you look at American Airlines and crude oil, they've spent many months trading in the same direction and many months trading in the opposite direction." In the past year, crude oil prices have fallen nearly 18 percent, while the NYSE ARCA index, which tracks major airlines, has fallen in sync, down more than 16 percent. But Mark Tepper of Strategic Wealth Partners believes declining oil prices prove a greater fundamental risk to the airlines because they need higher prices in order to charge more for seats. "A lot of people would think that low jet fuel prices would help the airlines," he said on "Trading Nation" on Thursday. "But oddly enough it actually hurts them, and that's really just because intense market competition forces them to give that money right back to the consumer essentially in real time." "I'd be staying away from the airline industry in general," Tepper warned. "If I had to pick one, I would pick American Airlines because they do have the best fleet."